We have some of the Citrus Magic air fresheners around! They are long lasting, great quality, with a variety of scents for your car. Our Citrus Magic brand is sure to last and have you coming back to order more. 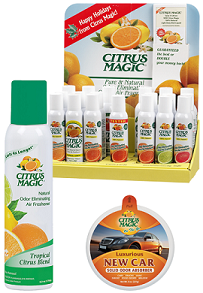 Come check out our great stock of Citrus Magic Air Fresheners! We have the lowest prices in the nation~GUARANTEED!